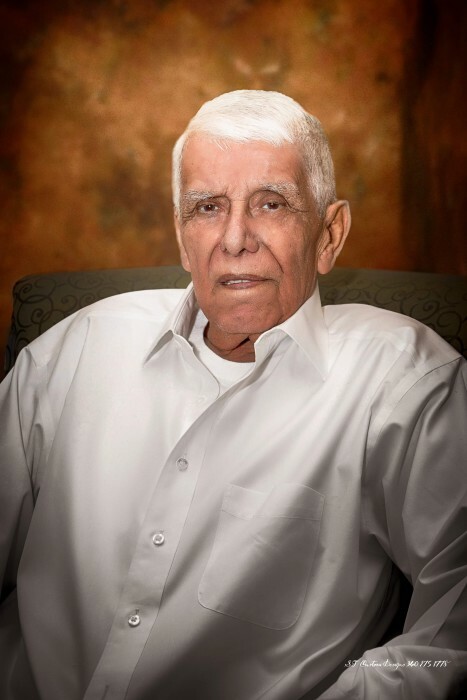 Luis Gonzales, Sr., 79, of San Benito, Texas passed away on Thursday, January 31st, 2019 at Valley Baptist Medical Center. On May 31st, 1939, Tomasa and Evaresto Gonzales welcomed the youngest of their sons, Luis Gonzales, to the world. Born in Los Flores, Texas, Luis was one of eleven siblings raised in the San Benito/Harlingen area and attended Harlingen public schools. Luis would often share his stories with his children about his adventures doing odd jobs as a young teenager that included being a milkman assistant for the Hygeia Company and working at the Harlingen Air Base assisting pilots to start their propeller engines. During his time working in Ohio, he met his first wife, Ofilia Costilla of Bettsville, Ohio. They were married in the late fifties and were the parents of two daughters Maria Luisa (Mary Lou) and Rosalinda. Sadly, shortly after the birth of their youngest child, Ofilia passed away leaving Luis to raise their two daughters. Luis also had a son, Johnny Garcia, who resided in Ohio and Illinois. In 1962, after returning to Texas, he met Herminia (Minnie) De Leon of San Benito, Texas. After a very short courtship, they were married and began their lives raising her daughter Juanita (Janie) Alma Balli, whom Luis loved and considered his own daughter. In 1965, Luis and Minnie welcomed their first born, a son, Luis (Louie) Jr. and two years later they gave birth to their youngest daughter, Edina (Dina) Gonzales. The second generation of Luis’ family included ten grandchildren: Veronica, Araceli, and Miguel Popoca; Justin and Briana Harrison, Ofilia, Mayra, and Samuel Gonzales; and Janice Alyssa Pinon and Tiana De Leon. He was also fortunate to have ten great grandchildren. He is preceded in death by his parents, siblings Tomas, Lucia, Alejandro, Eloisa, Santiago, and Herminia; his wives Herminia and Ofilia; and his daughter Janie. Luis is survived by his son Luis (Louie) Gonzales, Jr. of San Benito, his daughters Dina (Luis Benavides) Gonzales of San Benito, Mary Lou (Mervin) Harrison of Bettsville, Ohio, and Rosalinda Gonzales of Harlingen, and his son from Illinois, Johnny Garcia. His surviving siblings include sisters Guadalupe Barrera and Eloida Delgado of Harlingen, Amelia G. Keaton of Fremont, Ohio, and his beloved brother Evaresto Gonzales, Jr. of Edinburg. A memorial service will be provided for Luis at San Benito Funeral Home on Tuesday, February 5th. The services will begin at 12:00 pm - 3:00 pm for the immediate and extended family as they gather for a personal viewing. At 3:00 pm - 9:00 pm, the family will extend an invitation to all family, friends, and community members for the viewing and remembrance of Luis Sr.
Beginning at 7:00 pm, a holy rosary will be recited by family friend, Lali Betancourt. Immediately after, his children and grandchildren will offer their personal stories and reflections. All services will conclude at 9:00 pm with a final viewing and farewell. A cremation service will follow upon his personal wishes. The family would like to thank everyone who has provided condolences, words of comfort, and for their personal visits prior to his passing. They are truly blessed with an amazing outpouring of expressions from family, friends, medical staff, and our community. His children would like to thank their employers for their unwavering support during their time of loss; they include the San Benito School District, Valley Baptist Medical Center, and Ohio Department of Public Safety. A special thanks to the medical staff of the Retama Rehabilitation Center and the Valley Baptist Medical Center ICU Department for their professional and personal care during Luis’ stay.